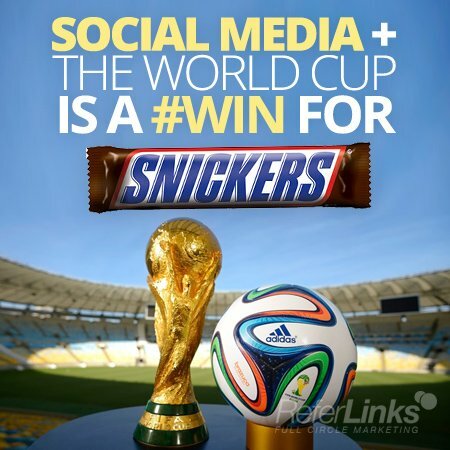 Social Media + The World Cup Is A #win For Snickers! With World Cup fever in the air, it’s certainly a great time to be a soccer fan! It’s a time that unites people across the globe to cheer for spectacular athletes representing a myriad of different countries on a grand stage. However, the 2014 World Cup has been even more of a popular topic at water coolers around the world, due to the events that transpired on Tuesday, June 24th. During a match between Italy and Uruguay, striker Luis Suárez literally bit Italy’s Giorgio Chiellini. In the midst of a whirlwind of emotions, outrage, and comedic punch-lines, this bite heard around the world was all over social media. The popular candy bar company, Snickers, then decided to “step up to the plate” and use this global news story to their advantage! The marketing geniuses behind this popular candy bar found an excellent way to make people mention the name “Snickers” whenever this topical, bizarre occurrence is discussed. Through their comedic “MORE SATISFYING THAN ITALIAN” post on Twitter, they found a way to increase their brand awareness during a massively popular event- the intense and exciting 2014 World Cup. To Snickers, it was a clear GOOOOAAALLLL! Do you think that the ad was hilarious and timely, or were you not very amused? Feel free to add your comments below! This entry was posted in Social Media and tagged 2014 FIFA World Cup,Brand Marketing,Online Marketing,Snickers,Social Media,Social Media Marketing,World Cup,World Cup Social Media on July 15, 2014 by ReferLinks Online Marketing.